Mark the Card Number you want to play - one digit for each vertical line. Mark your Play Type, which determines the cost of your ticket. 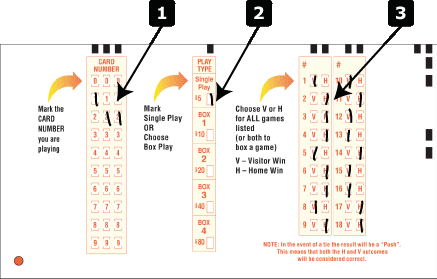 You can "box" up to four games, to select both Visitor Win (V) and Home Win (H) for those games. Make your predictions. You must make a prediction for every game on the COPENHAGEN POOLS Card. Give the completed slip and your wager to the Retailer before the COPENHAGEN POOLS Card closing date. Check your ticket before leaving the store to make sure it`s what you selected. Players Club members can now pay membership fees online where your Players Club card is linked to your online account. Plus all members can benefit from multi-year renewal options. Link your Players Club card to your online account on the "Card Management" page in your "Account" menu. You can then renew your card using funds in your account. To renew your Players Club card now just Login or members without an online account can Join-Up. Have your Players Club card number handy and enter your card number when joining.